KIVA, or Keeping Independent Visions Alive, serves transitioning graduates of Santa Fe public schools who were enrolled in special education programs while in school. They are 18-22 years old when they enter KIVA, and many Santa Fe nonprofits participate to make work opportunities available to them. KIVA members volunteer at six different locations throughout the week. At ADW, 9-10 members of KIVA arrive at our offices by bus to participate in a weekly class, run by trainer Anna Wilder. Wilder works with KIVA participants to focus on increasing social awareness and interactive opportunities through supervised engagement with assistance dogs. The students progress to learning some basic training commands. As they do, they become mutually supportive of one another as the work of the program evolves over the year. One such milestone lies in learning that the “come” command works, when teaching a dog to approach you. Wilder adds that for KIVA participants, it’s not just that self-confidence ensues but also that working with the dogs provides therapeutic relief from social anxieties connected with isolation caused by having a disability. When one of her students first started coming, Wilder says, he was so afraid of dogs that she would build a barricade of chairs that he could stand behind to talk to the dogs and feed them treats. The impact of such a personal milestone when seen across a population of transitioning KIVA students is enormous. 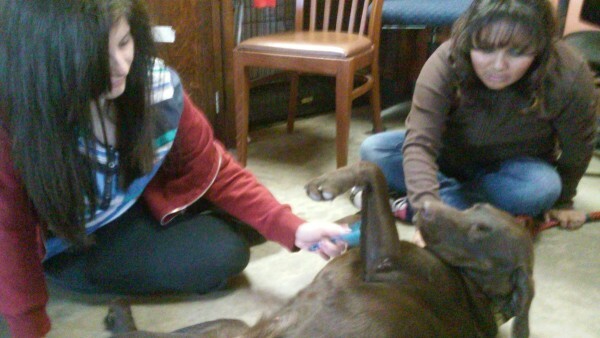 ADW dog training helps them with social skills needed in professional settings. The repetition of showing up to class helps them to become more independent. Playing fun games with the dogs is one of the ways that this learning gets reinforced. “We play a sequencing game where we stand in a circle with a toy. Somebody does something with the toy and passes it to the next person.” Learning to watch and imitate behavior helps the students’ timing, Wilder relates. 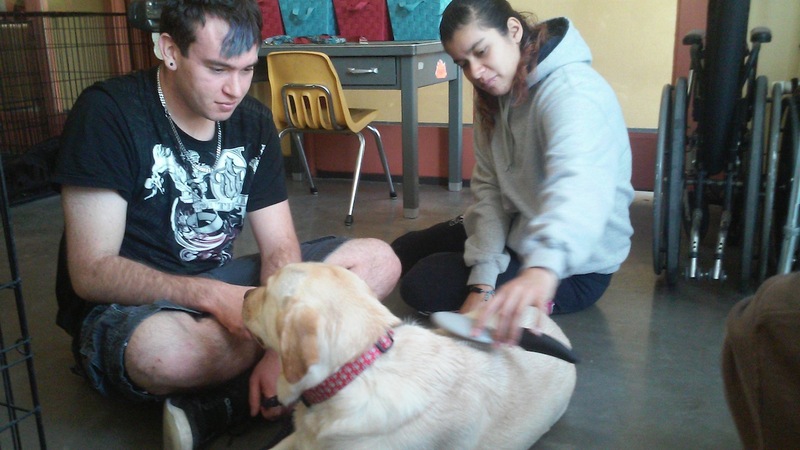 It also helps to create mutual reinforcement among the students that extends to their work with the dogs. For certain KIVA students who are non-verbal, there has been an added benefit, too. Play with a clicker has also created more confidence for them in other parts of their lives, she says, because the clicker can also indicate their assent or refusal to issues of daily living.